This wonderful assortment of dried summer herbs and spices brings the warm taste of the French country to your dish. We add a hint of lavender to create the reminiscence of Southern French cooking. 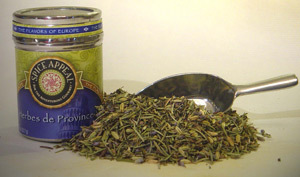 This delicate country blend includes thyme, rosemary, savory, basil, lavender, and other herbs and spices. Enhances the flavor of soups, stews, and sauces. Excellent for roast chicken. Sprinkle on omelets and green beans. Add to stuffed eggplant, squash, and salad dressing. A flavorful addition to a wide variety Mediterranean dishes.